Food service in public schools is changing in order to provide students with fresher and more nutritious choices. This much needed facility will create a better lunch-time experience for students and will enable the staff to work more efficiently. The original kitchen was located in a renovated portion of a classroom building. Students walked upstairs and lined up in a corridor adjacent to classrooms, disrupting classes in progress. Once they received their lunch, they exited down a ramp and walked across a play area to the lunch shelters. Dry goods were stored in a storage room located in the adjacent auditorium requiring kitchen staff to haul goods back and forth between two buildings. The new building, designed in association with Lehrer Architects, features large, soaring roof elements that hide rooftop equipment and provide shelter from rain and sun for queuing students. The 1,900-square-foot building contains a modern commercial-style kitchen with two serving lines. All storage associated with food preparation is located within the new facility, increasing the efficiency of both food preparation and serving. 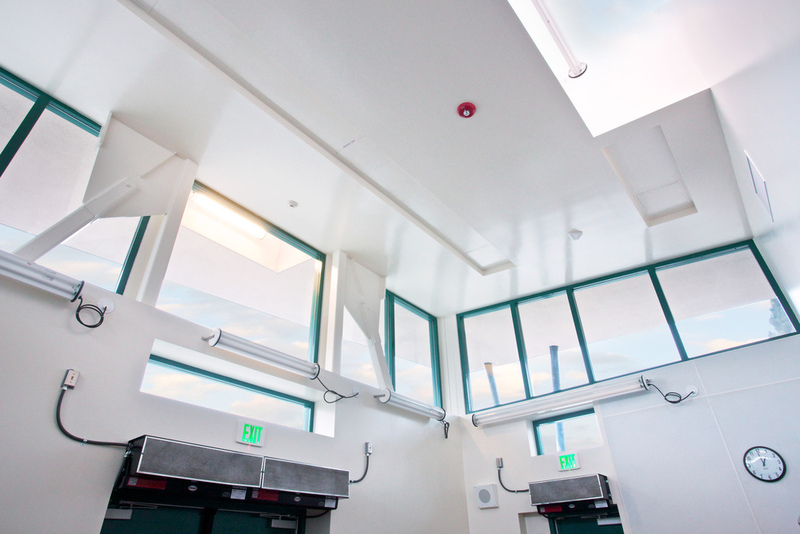 Located at-grade, the replacement structure is closer to the lunch shelters, relieving noise and classroom disruption.